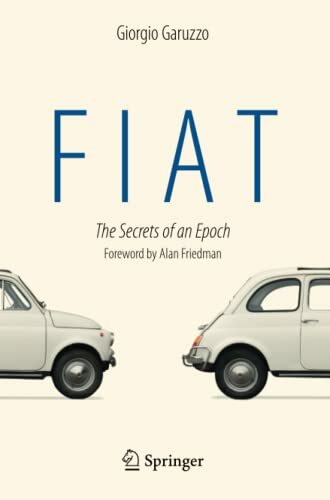 This first-hand account of the largely unknown story of Italian car manufacturing company Fiat between 1976 and 1996 details the key events and people at the heart of the company’s development, all from the perspective of top Fiat manager Giorgio Garuzzo. Giorgio Garuzzo was born in 1938 in a village of Piedmont Alps, and, after graduating in electronics at Politecnico di Torino in 1961, worked for twelve years in the mainframe computer industry of Olivetti, General Electric and Honeywell. In 1976 he joined Fiat as an aid to the maverick entrepreneur Carlo De Benedetti, but when his boss endured a hundred days only as CEO of the Group, he persisted for twenty years. After contributing to the creation of Comau, the production systems company, and heading Magneti Marelli and the many other companies of the Components Sector, since 1984 he managed the recovery of Iveco, the industrial vehicles company, also acquiring the truck activity of Ford and Seddon Atkinson in UK, Pegaso in Spain, Astra in Italy, and Ashock Leyland in India and establishing the 1985 joint venture in China with Nanjing Motor Corporation. For the agricultural product division of Fiat, in 1990 he attained the acquisition of Ford of New Holland, the tractor and farm equipment arm of Ford. In 1990 Gianni Agnelli, the charismatic majority shareholder of Fiat, appointed him as Chief Operating Officer of the whole Group, with responsibility upon all its industrial activities. He became Chairman of Fiat Auto, Iveco and New Holland and in 1991 contributed to the foundation of ACEA, the European Automotive Manufacturers Association, which he chaired in 1994 and 1995. In a book he tells the story of his experience within the Fiat group, candidly including his involvement in the Italian judiciary “Clean Hands” investigations of the 1990’s and his disagreement with the Fiat’s CEO, Cesare Romiti, who forced him to resign in 1996. After being active since then in the private equity industry, he is currently Chairman of an investment company listed at the Milan stock exchange. His wife Rosalba manages the Garuzzo Institute for the Visual Arts (IGAV), a family foundation aimed at the international promotion of young artists, when his son Carlo is fully dedicated to the development of renewable sources of energy. Giorgio Garuzzo’s many interests, particularly with travel and science, and the time he happily spends with his two grand children, prevent him to be anything more than a perennial beginner on the golf courses. This book is an authentic historical document, supported by extensive analytical information, in which former Fiat top manager Giorgio Garuzzo passionately recounts his experience within Fiat between 1976 and 1996. It is a narrative from the inside that sheds new light on events that have remained cloaked in mystery: the arrival and departure of Carlo De Benedetti, the “march of the forty thousand”, the sacking of Vittorio Ghidella, the clashes between Umberto Agnelli and Cesare Romiti, the Group’s involvement in the “clean hands” scandal, the role of Gianni Agnelli and his relationships with his brother and Cesare Romiti and the intervention of Mediobanca. Garuzzo discusses the issues connected with the range of cars and marques, touching on major themes of national or international relevance that were unrelated to Fiat but nonetheless conditioned its activities: terrorism and the unmanageability of the factories, inflation, the devaluation of the lira, the role of the trade unions and the General Confederation of Italian Industry, Japanese competition and European integration.